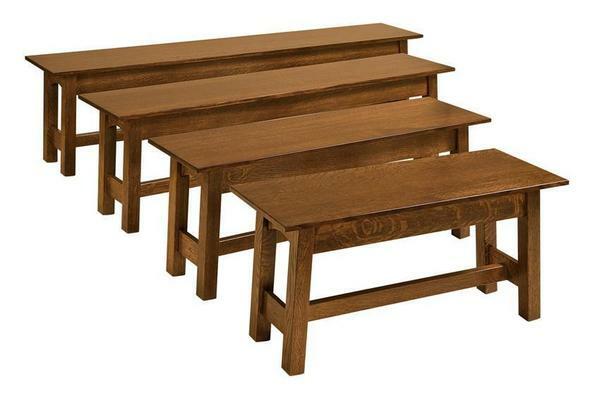 The beautiful McCoy Bench is available in a wide variety of woods to fit your home and style! You can choose from Oak Wood, Brown Maple Wood, Rustic Cherry Wood, Quarter White Oak wood, or Cherry Wood! Also choose from a variety of sizes to get the perfect fit for your home! The bench is built to order so you will have a one of a kind piece of Amish furniture! Choose Width: 36", 44", 60" or 72"
The benches were delivered this morning and installed. They look great and everyone is very happy. Simon was wonderful and arrived ahead of schedule – which was so helpful. Thank you so much for your assistance.